On Sale Now! 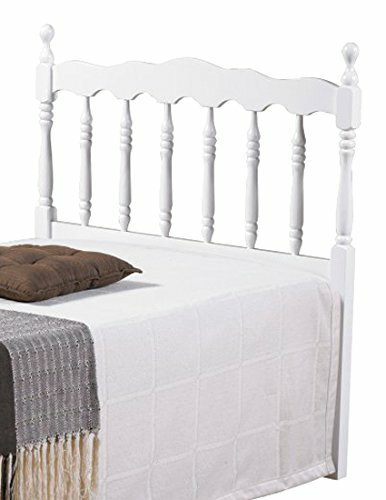 Save 2% on the Donco Kids Spindle Headboard by Donco Kids at Indsight. MPN: 704TW. Hurry! Limited time offer. Offer valid only while supplies last. If you've been looking to add a little vintage inspiration to your little one's bedroom decor, look no further than the donco spindle headboard. If you've been looking to add a little vintage inspiration to your little one's bedroom decor, look no further than the donco spindle headboard. Looking sweeter than a dream, this headboard features a classic spindle design and ball finials to create a downright enchanting design. The headboard is crafted of solid wood and you'll have your choice of both bed size and finish. Headboard only - bed not included. About donco trading headquartered in fort worth, Texas, donco trading company has made youth furniture their specialty. The family-owned and -operated business carries a full line of day beds, platform beds, bunk beds and more - all reasonably priced. They distribute to and work directly with small business owners, specialty stores and more in locations throughout the country. In addition to the fort worth office, they also have a distribution center in Kenosha, Wisconsin and showrooms in tupelo, Mississippi and high point, north Carolina. Additional limited-time savings reflected in current price. Your choice of size and finish. Solid wood construction. Charming spindle design. Ball finials. Headboard only - bed not included.